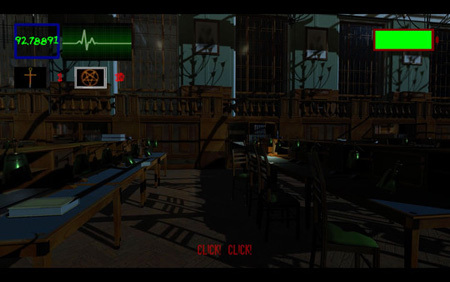 Deadly Curse: Insane Nightmare is an action-packed adventure game from Electrical Eagle. You enter a mental hospital where doctors are experimenting on patients unlike never before. A priest is here to help the doctors without knowing the stuff they do to those patients. As you explore the hospital, you will have to find the 10 pictures took by the maid 60 years ago. You will also need to find the key with those pictures. However, the hospital is cursed and you will find lots of ghosts and enemies there. You don’t have any weapon either, so you must make sure that you avoid any dangerous situations. If your heart rate goes over 160, you will die. That’s why you need to find a way to eliminate those enemies before the heart rate goes too high. All you have is an emergency kit and a battery. Be prepared, the things you will uncover are not pleasant, but they may help you find a solution to a current day situation as well. If you get stuck in the game, check out the video walkthrough and gameplay for the game. This entry was posted in PC Games, Walkthrough and tagged Deadly Curse: Insane Nightmare Cheats, Deadly Curse: Insane Nightmare Game, Deadly Curse: Insane Nightmare Gameplay, Deadly Curse: Insane Nightmare Guide, Deadly Curse: Insane Nightmare Hints, Deadly Curse: Insane Nightmare Review, Deadly Curse: Insane Nightmare Solutions, Deadly Curse: Insane Nightmare Strategy, Deadly Curse: Insane Nightmare Tips, Deadly Curse: Insane Nightmare Walkthrough by Marvin. Bookmark the permalink.